It’s been a long cold winter, even here in Florida. I know it sounds crazy to all you guys who have to tough it out in the real cold, but we’re just as ready for the warm temperatures as our Northern friends are. That’s why were getting out early this spring to celebrate the warmth and say adios to those cold winter days and nights. One of my favorite places to go out to eat locally os our Bahama Breeze. It’s such a wonderful atmosphere there. We love to sit out on the deck this time of year and enjoy the live music. The weather is perfect. It’s not too cold and not too hot. It’s just like going to one of our favorite beach bars, without actually having to drive to the beach. And of course one of my favorite parts about Bahama Breeze are all their cocktails, especially those insanely delicious margaritas. And now that I’m pregnant, I don’t have to say no to a cocktail because they’ll make any favorite cocktail into a the best mocktail that’s ever passed you’re lips. Last Friday night we got to experience Bahama Breeze Viva La Rita. It’s such a fun celebration with live music, fresh cocktails and giveaways too. 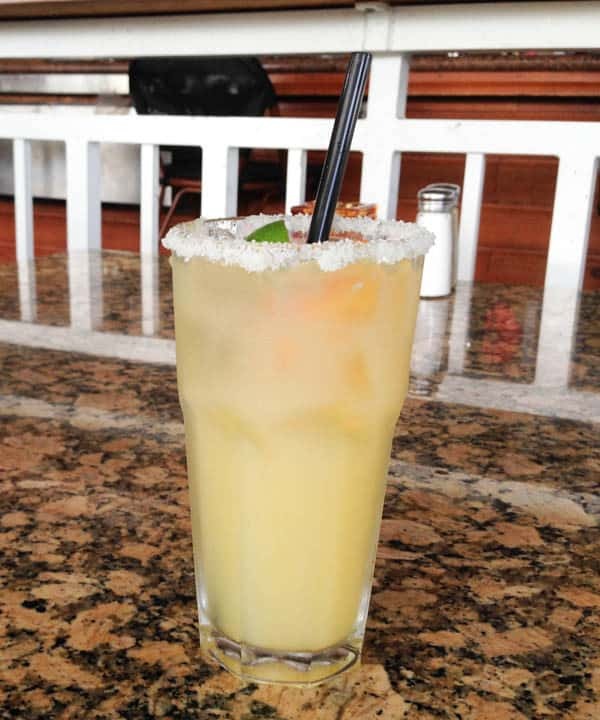 The fun started on National Margarita Day, and will last through Cinco de Mayo. 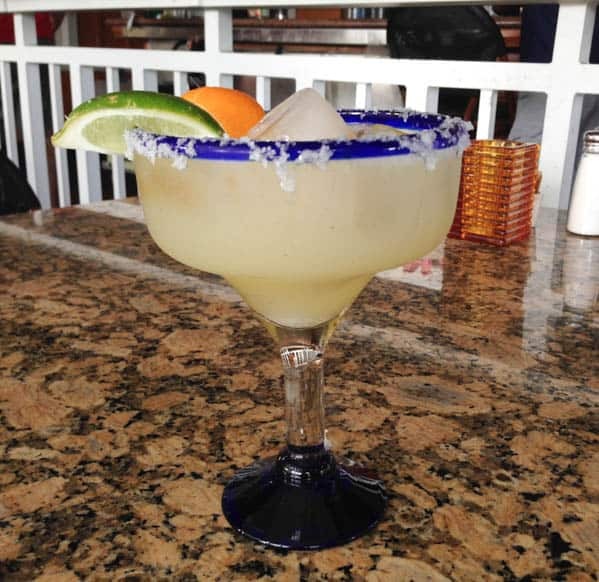 They’ve got four new amazing hand crafted margaritas to choose from. They have the Classic Margarita, a Top Shelf Margarita, the Ultimate Margarita and the Ultimate Cornorita. 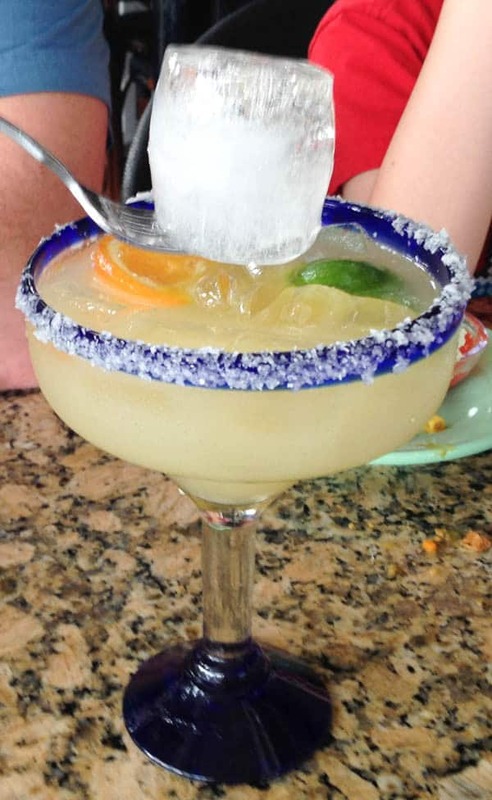 My husband choose the Ultimate Margarita. 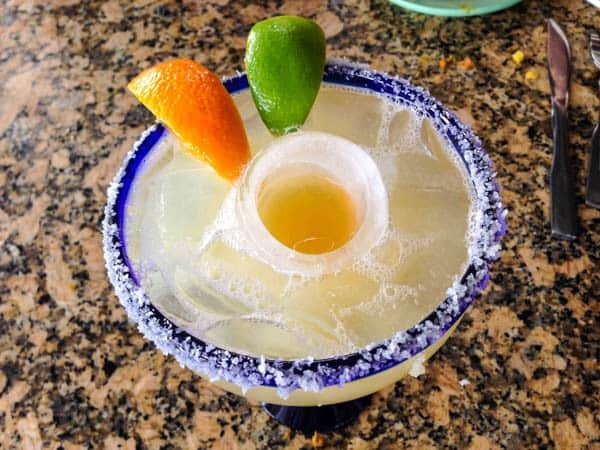 It’s a hand-shaken ‘rita that features Patron tequila, Cointreau, lemon, lime, crushed sugar cane, and a frozen ice shot filled with Grand Marnier. It’s served in a hand blown margarita glass and makes for the perfect Margarita. Isn’t that innovative? I love that little ice shot glass. So cute! This is the virgin margarita I had. The waiter asked me if I liked a sweeter or more sour margarita, and was able to tailor this margarita mocktail to my own personal tastes. It was wonderful and paired perfectly with dinner! 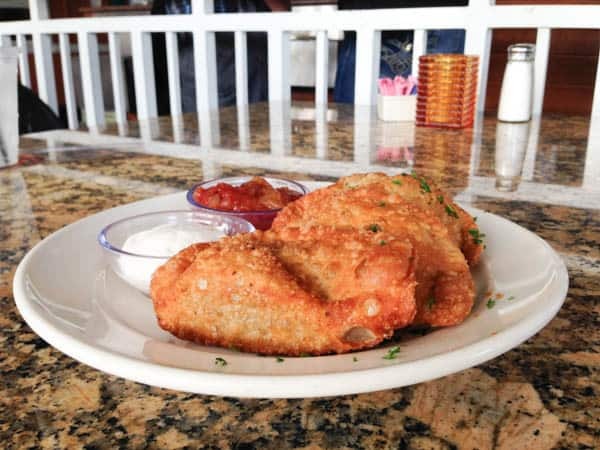 For appetizers, we got some beef empanadas. It was one of the few appetizers we hadn’t yet tried at Bahama Breeze, and I think we saved the best for last because those beef empanadas are all I can think about now. They were absolute perfection. 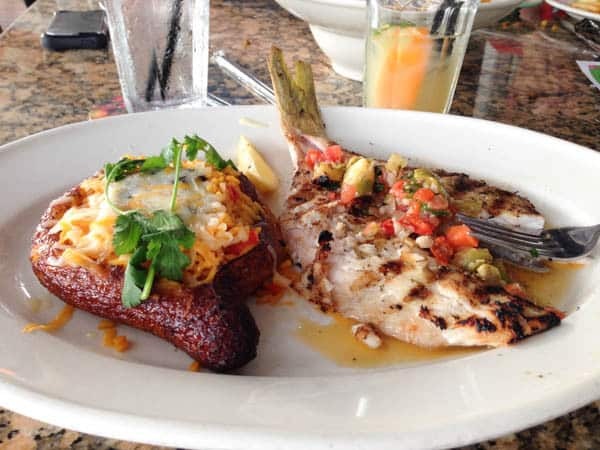 For dinner, I usually just order one of the fresh catches, and this time I really wanted some snapper, so I got the yellow tail snapper vera cruz served with yellow rice, black beans and plantains. It was amazing. My husband wanted to try one of the new rice bowls so he got the carnitas bowl. It may not be the prettiest, but I can say it is the tastiest rice bowl I’ve ever had, and my husband agreed. 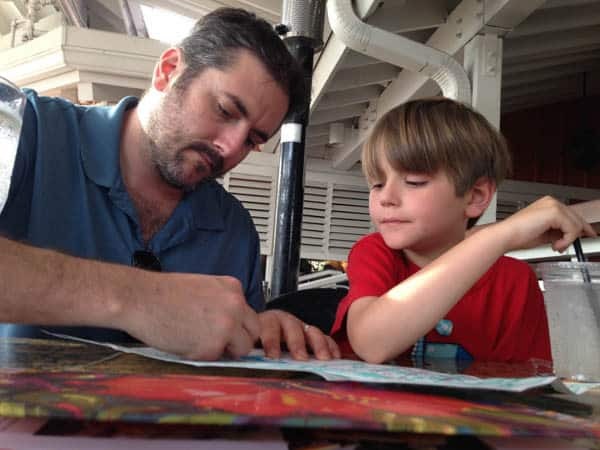 Here’s my son and husband having fun with some kid’s activities they brought to the table. 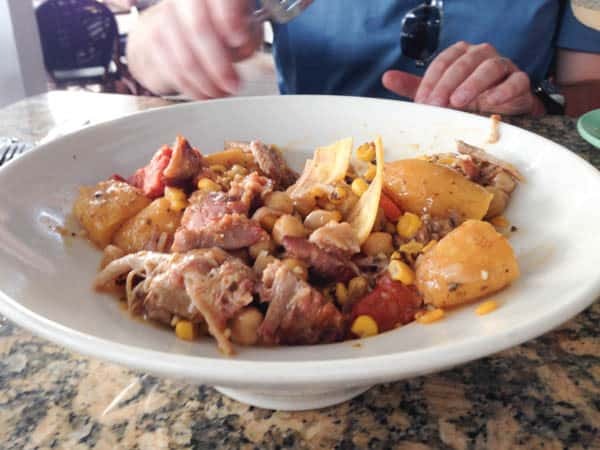 Bahama Breeze not only has lots of more adult fun, but good fun for the kids too. There’s a great kids menu and they’re very family friendly. And I almost forgot to mention the winner of our last Bahama Breeze giveaway. Nancy from The Bitter Side of Sweet was the winner of the $100 Bahama Breeze gift card. I’m excited you’ll be able to visit Bahama Breeze to celebrate Viva La ‘Rita with your family. Congratulations! So be sure to visit your local Bahama Breeze now through May 5 so you can experience Bahama Breeze Viva La Rita for yourself! Don’t forget to call ahead to find out when there will be live music, because that’s the best part! Bring your friends and loved ones out to Bahama Breeze to share the experience, and make sure you also enter the @BahamaBreezeIslandGrille Instagram contest by using the hashtag #VivaLaRita. Just snap some pictures and upload them to Instagram of your cocktails, food or friends at Bahama Breeze and tag them with #VivaLaRita. You could win great prizes like t-shirts, gift cards or an island party for you and your friends! Wow, looks like so much fun, I can’t wait to go! I love going to Bahama Breeze, and am so excited to try that new Margarita! I had no idea they could make a virgin margarita. Impressive!